While most advisors start by discussing strategies that they use, we have a different discussion. We start “above” the horizon. We ask thoughtful questions about your dreams, priorities and near- and long-term goals for the future. We work to discover your underlying goals and understand your vision (even help you clarify it yourself) before we ever get down to the finances. With a shared vision “above the horizon,” we then move “below the horizon” and consider solutions. This is where most advisors start as they get right into the details of your income taxes, investment portfolios, retirement income strategies, estate planning strategies, stock option strategies and more. We have found that it is beneficial for clients to have clarity about their financial goals and priorities before they have to make any decisions. Once we have a vision of what’s “above the horizon,” we begin to create a blue-print for “below the horizon.” At this stage we get into the strategy and solutions for achieving your goals. The process allows us to have the ability to provide creative solutions and then proactively implement them. 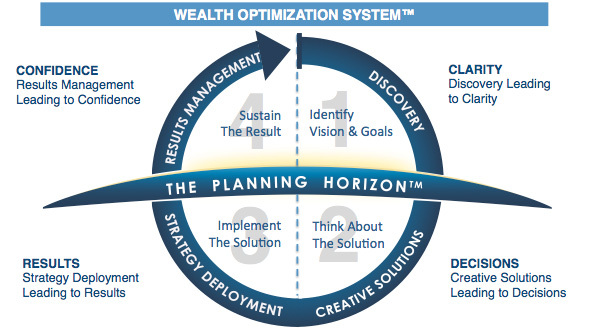 This allows a client to comfortably make decisions about a personalized investment portfolio and financial plan. We make concrete recommendations to help ensure that everything “gets done” the right way at the right time, and then we communicate to help make sure your plan stays on track and is modified to achieve your short and long term goals. We have found that clients have difficulty implementing decisions when they don’t have clarity about how the strategies they have to implement are tied to their goals. The key to achieving your immediate and long-term financial growth and independence is integrated with your basic selection of your mission, vision, and goals. This creates the ability to manage your vision over time as the economy, your life situation or your goals change. Results management leads to confidence that your plan is working. Naturally, over time, we tailor our style to the way you work best, so that we can proactively and effectively initiate, implement and monitor your long-term plans. Such a close working partnership not only ensures that we are listening, but that we can discuss and make appropriate changes to your portfolio when needed. At this stage life often causes changes in the planning horizon. It is at this point that we revisit our goals and strategies to see if we need to modify and fine-tune our overall plan.